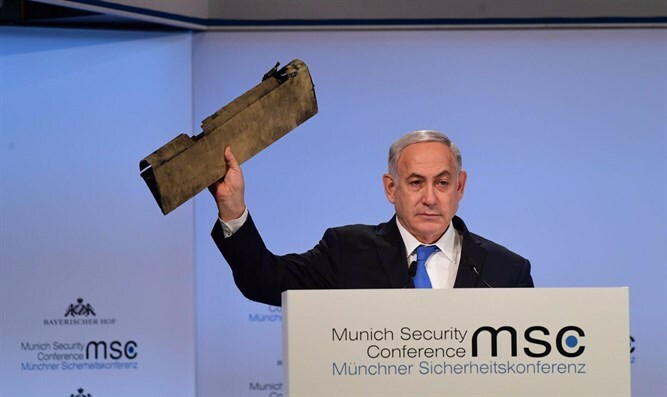 Israeli Prime Minister Binyamin Netanyahu warned Tehran on Saturday over aggressions by what he called Iran and its "proxies" in Syria, while showing what he said was a piece of an Iranian drone shot down in Israeli airspace. "I have a message to the tyrants of Tehran: Do not test Israel's resolve," Netanyahu said at the Munich Security Conference. "The Iranian regime is hurting its own people. Iran is not Nazi Germany and there are many differences between the regimes, but there are also many similar points: Iran has repeatedly said it wants to destroy Israel and is threatening the world with violence. Iran has to decide whether it is a country or a problem. They chose to be a problem that also threatens you. As far as I'm concerned, Iran is the greatest threat to the entire world, not just to Israel," Netanyahu said. Netanyahu also referred to the conference's venue. "Here, exactly, four decades ago we realized how important our security is. Without security, nothing can exist, no peace, no security, no prosperity. For the Jewish people, two decisive events occurred here: In 1972, 11 of our athletes were murdered here, and 80 years ago there was an event here with serious consequences, which signaled the most difficult period in history. "The leaders who signed the agreement here were people who thought they were bringing peace and strengthened the Nazis in the Munich agreement. They could have chosen a different route," Netanyahu concluded.